Richard Dadd (1817–1886), Sketch to illustrate the Passions, The Recklessness (1855), watercolour on paper, 35.8 x 25.9 cm, The British Museum, London. Courtesy of and © Trustees of the British Museum. Had Richard Dadd developed his psychotic mental illness and murdered his father a century earlier, he would probably have hung for it. Increasingly enlightened attitudes toward mental illness in the nineteenth century may have spared him the gallows, but left the bleak future of permanent confinement in a secure institution. Dadd started this at Bethlem Hospital, the origin of the word bedlam, but by this time situated in Lambeth, where its remains now house the Imperial War Museum. The medical speciality of psychiatry was not so much in its infancy, but still in gestation. Bethlem’s doctors and employed attendants were supplemented by lay volunteers, led by the Quaker movement, but the hospital was also victim to continuing struggles between legislators and idealists. Within this, Dadd was kept in a special gender-segregated secure area for ‘criminal lunatics’, who were herded together regardless of their background or condition. This was more enlightened than in the past, but hardly conducive to improvement in his health, or to Dadd’s creative drive. Once he had completed most of the paintings which remained outstanding in his visual memory from his travels in the Middle East, Dadd started to develop works driven more by his own imagination. 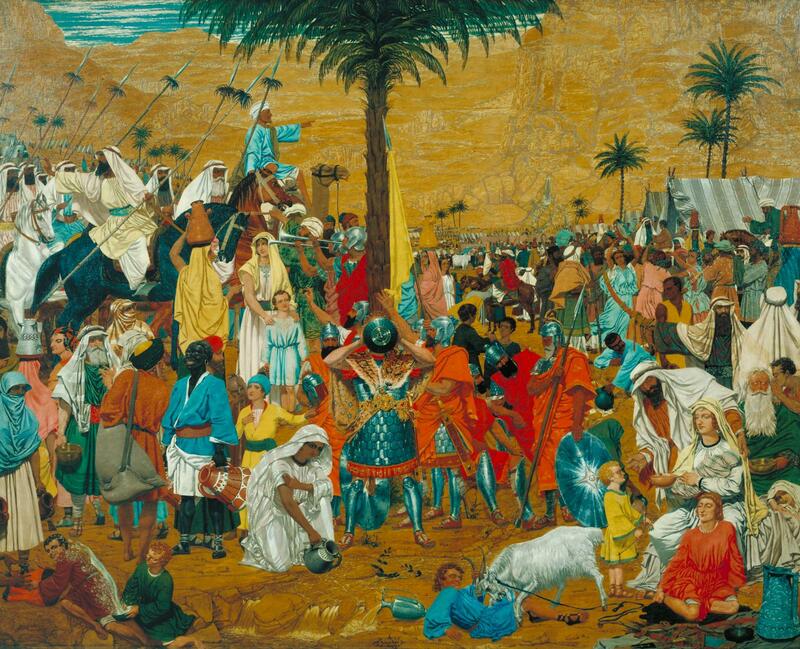 One of the first of these is The Flight out of Egypt (1849-50), which uses the landscapes which he had seen overseas (here possibly Ein Gedi, near the Dead Sea) as a stage for Biblical narrative (the exodus of the Israelites from Egypt) and personal commentary. Like his earlier faerie paintings, this crams in a large number of figures, but many are now recognisably drawn from paintings which remained in Dadd’s visual memory. A dancing girl holding a tambourine above her head, in the right middle distance, could have come from a painting of a Bacchante; two helmeted soldiers in the centre may have come from David’s Oath of the Horatii (1784). This results in an appearance of pastiche or collage; given Dadd’s inability to paint this work from life, this is inevitable. Richard Dadd (1817-1886), The Infant Aesculapius Discovered by Shepherds on a Mountain (1851), watercolour, dimensions not known, Wellcome Library, London. Courtesy of Wellcome Images images@wellcome.ac.uk http://wellcomeimages.org, via Wikimedia Commons. Dadd’s unusual watercolour of The Infant Aesculapius Discovered by Shepherds on a Mountain (1851) shows a rare motif in visual art, and (as I have speculated before) may have arisen from the artist seeing a painting of this story by Tognolli. 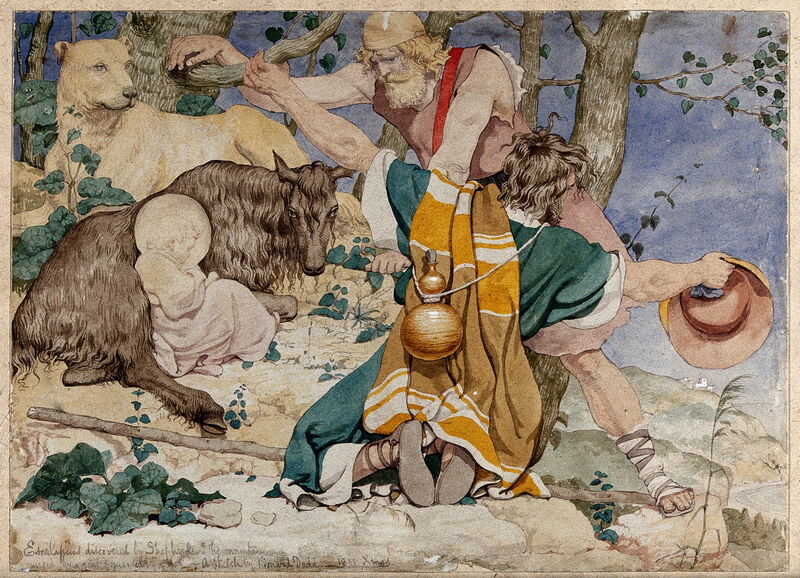 It shows Aesculapius being raised by a goat, as told in myth, adding a couple of shepherds, but omitting a snake which was an essential part of the story. Richard Dadd (1817–1886), Sketch of Robin Hood (1852), watercolour and graphite on moderately thick, slightly textured, cream wove paper, 35.9 x 25.7 cm, Yale Center for British Art, Paul Mellon Collection, New Haven, CT. Courtesy of the Yale Center for British Art. 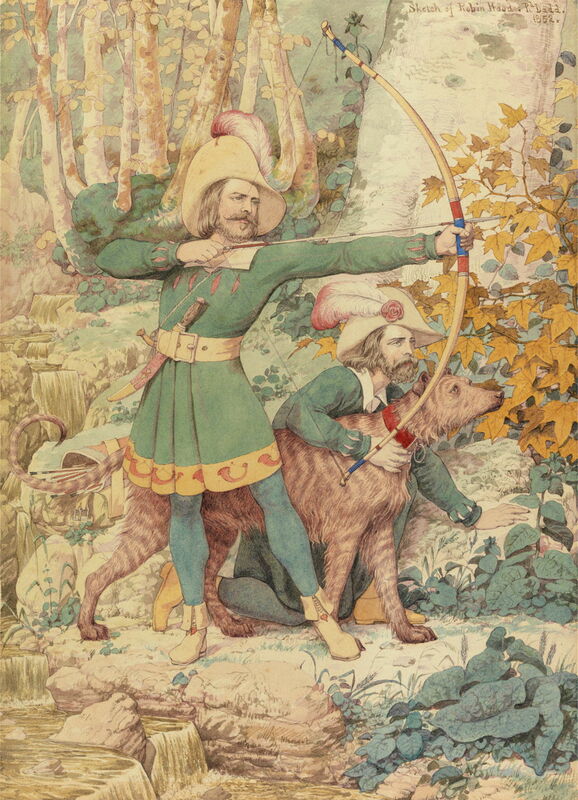 Dadd’s watercolour Sketch of Robin Hood (1852) shows him turning to another folk story which would have fired his imagination. Robin Hood was a popular figure in folk culture, an outlaw who redistributed wealth by robbing the ‘evil rich’ and giving the wealth to the dispossessed poor. 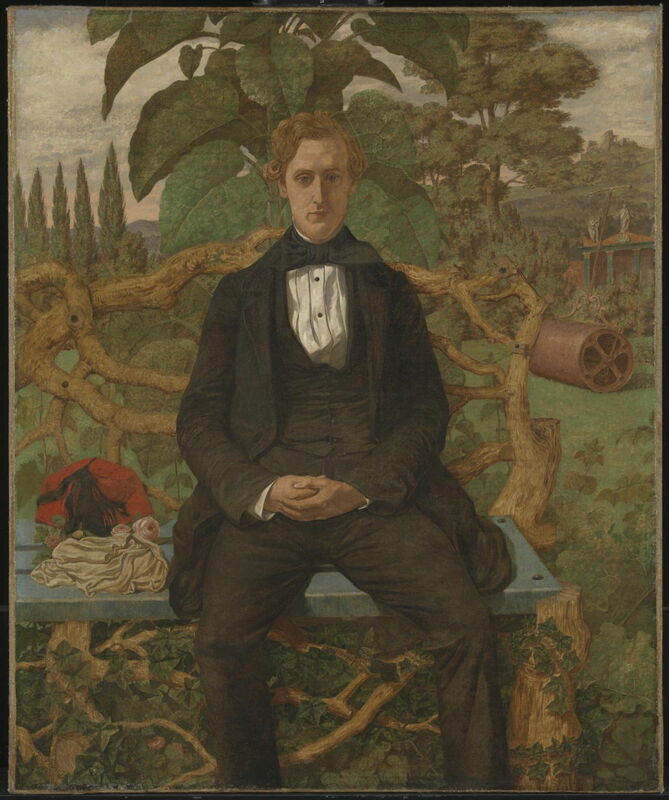 Richard Dadd (1817–1886), Portrait of Sir Alexander Morison (1852), oil on canvas, 51.1 x 61.3 cm, The Scottish National Portrait Gallery, Edinburgh. Wikimedia Commons. Several of those involved in Dadd’s care were amateur artists, or collectors. In the 1840s, a prominent proto-psychiatrist of the day, Sir Alexander Morison (1779–1866), started acquiring Dadd’s watercolours, and the two privately became friends, with Morison supporting Dadd’s painting as a silent patron. 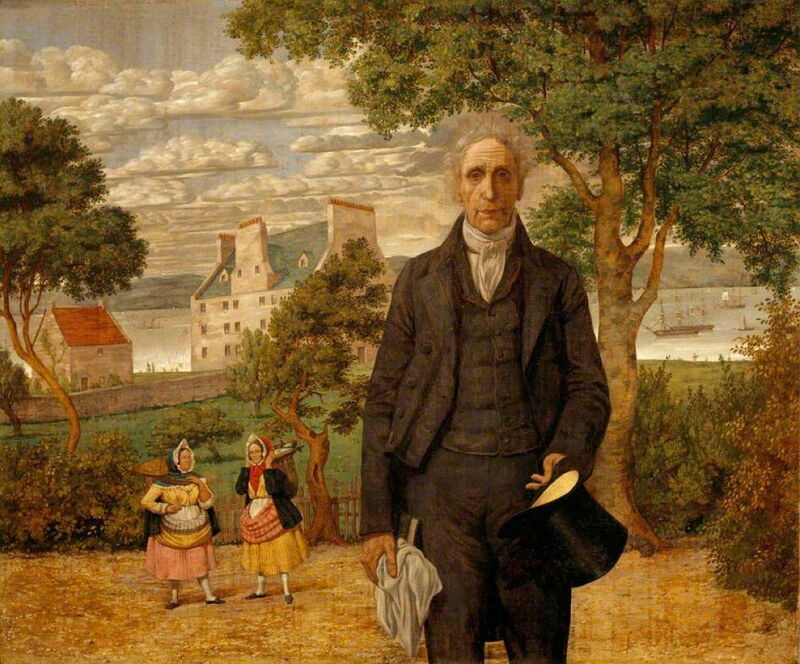 This also resulted in Dadd’s Portrait of Sir Alexander Morison (1852), which has a style anticipatory of Grant Wood’s American Gothic (1930), perhaps, and a worryingly sloping horizon. Dadd painted Portrait of a Young Man shortly after that, in 1853, as he was turning to a novel series of watercolours depicting the passions, which may have been a theme suggested to him by those involved in his care. Richard Dadd (1817–1886), Sketch for the Passions: Love (1853), watercolour, black ink, and graphite on moderately thick, slightly textured, light blue wove paper, 35.9 x 25.7 cm, Yale Center for British Art, Paul Mellon Collection, New Haven, CT. Courtesy of the Yale Center for British Art. 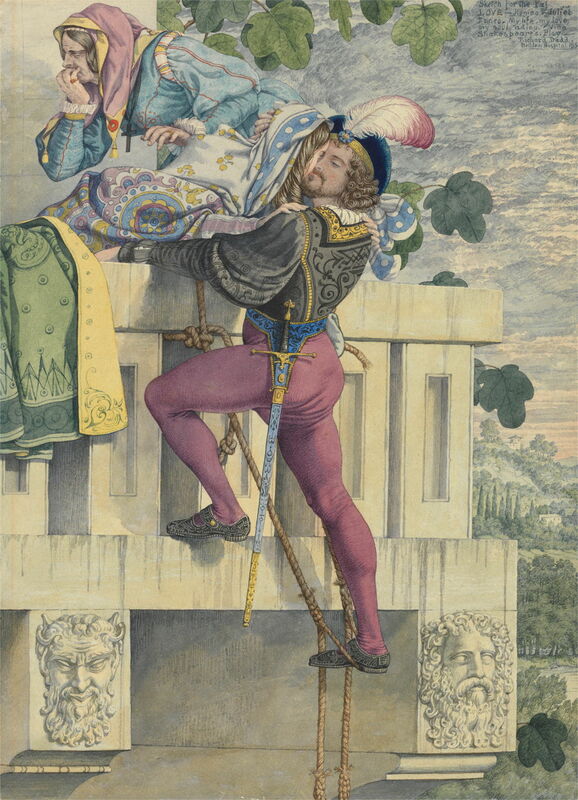 One of the first in this new series is this watercolour Sketch for the Passions: Love (1853), showing a moment from the famous Balcony scene in Shakespeare’s play Romeo and Juliet, Act 3, scene 5, which Dadd inscribed: Romeo – My life, my love, my soul adieu. Richard Dadd (1817–1886), Sketch of A Curiosity Shop (1854), watercolour on paper, 25.8 x 36.4 cm, The British Museum, London. Courtesy of and © Trustees of the British Museum. 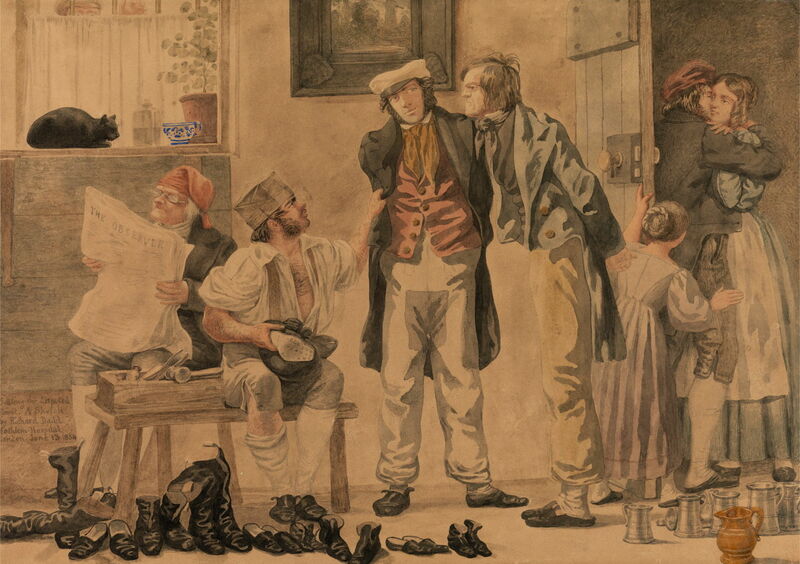 Sketch of A Curiosity Shop, a watercolour dated 22 June 1854, appears to have been inspired by a published engraving of Daniel Maclise’s Salvator Rosa and his Patron (1835), which Patricia Allderidge shows from an issue of The Art Journal in 1848. Richard Dadd (1817–1886), Mercy: David Spareth Saul’s Life (1854), oil on canvas, 61 x 50.8 cm, J. Paul Getty Museum, Los Angeles, CA. Wikimedia Commons. By the middle of the 1850s, some of Dadd’s oil paintings became lighter in touch. His Mercy: David Spareth Saul’s Life from 1854 shows another Biblical narrative, recast in mediaeval form. This takes the artist back out into the desert of Ein Gedi, by the Dead Sea, where King Saul had pursued David. Despite Saul’s hostility towards David, when David’s general comes across the sleeping king, David instructs that his life is to be spared. Richard Dadd (1817–1886), Settling the Disputed Point (1854), watercolour and graphite on moderately thick, slightly textured, beige wove paper, 25.4 x 36.5 cm, Yale Center for British Art, Paul Mellon Collection, New Haven, CT. Courtesy of the Yale Center for British Art. 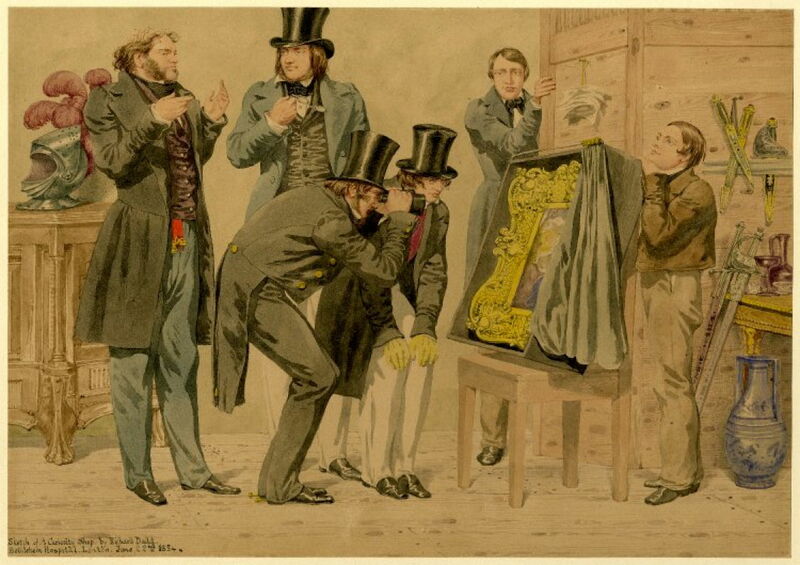 Dadd painted and dated his watercolour Settling the Disputed Point on 13 June 1854, another of his clearly narrative works, but left few clues as to how it is to be read. At the centre are two men engaged in some sort of dispute with the cobbler, seen to the left, who has no shortage of work in front of him. It is unclear, though, what the man reading The Observer newspaper has to do with this, or the couple kissing outside the door, which is being opened by a girl, or the collection of tankards on the ground at the right. Over his years at Bethlem, Dadd completed thirty-two watercolours in his Passions series. Several addressed more negative emotions, such as Sketch to illustrate the Passions, The Recklessness which is dated 19 March 1855. 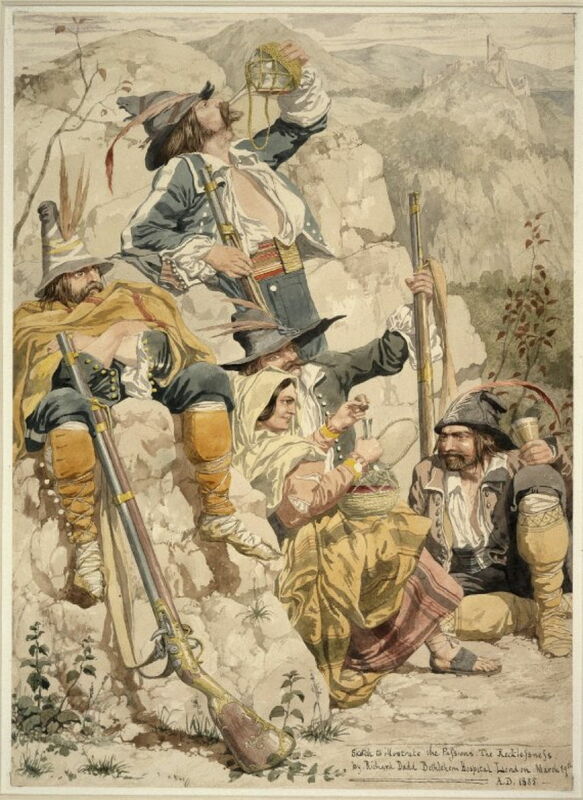 This painting does not seem to invoke any theatrical scene, but shows a party of four armed brigands drinking with a feisty woman, who probably acted as a lure for the gang’s victims. The group appears to be laying in wait in rocky terrain, at the edge of a track in the hills, presumably ready to rob the next travellers to pass by. 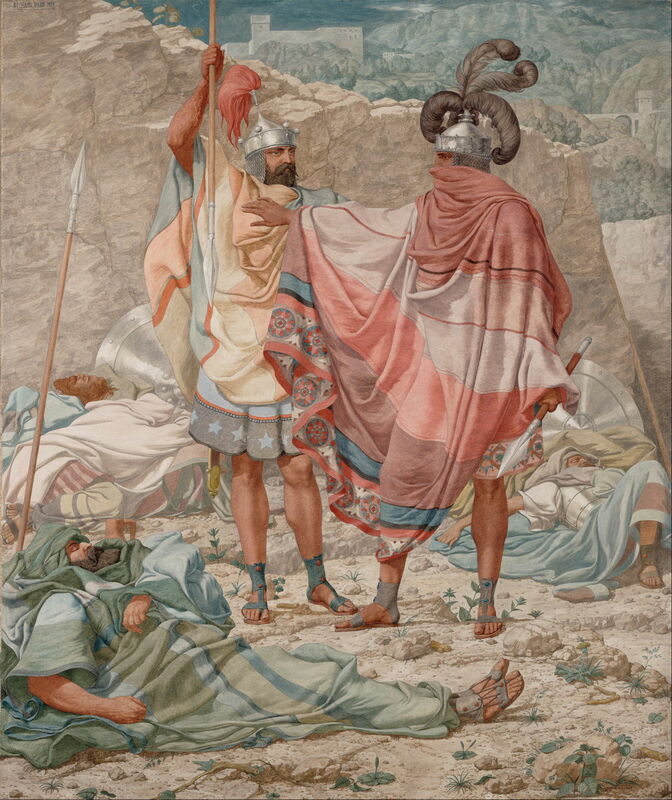 Richard Dadd (1817–1886), Death of Abimelech at Thebez (1855), watercolour, gray ink, and graphite on moderately thick, slightly textured, cream wove paper, 35.9 x 25.7 cm, Yale Center for British Art, Paul Mellon Collection, New Haven, CT. Courtesy of the Yale Center for British Art. 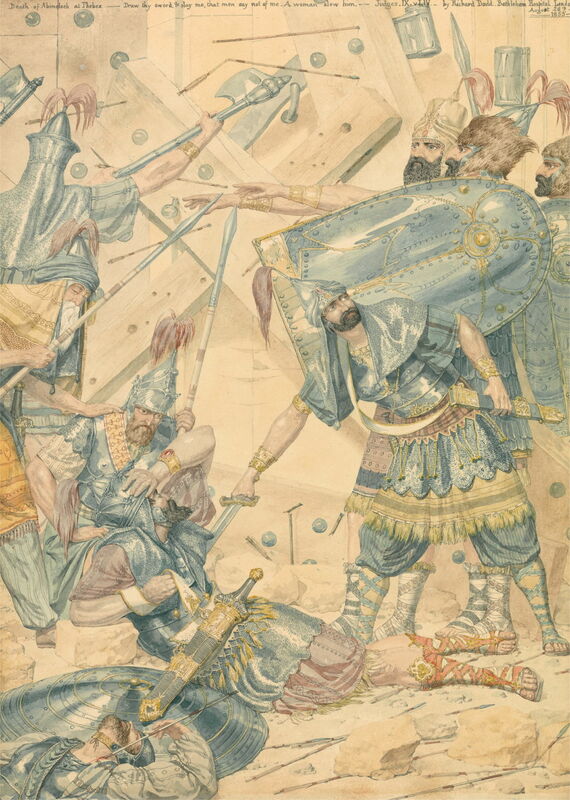 Death of Abimelech at Thebez, dated 28 August 1855, is another watercolour with an Old Testament narrative: taken from the Book of Judges, it tells of the wicked King Abimelech, who killed his seventy brothers and the people of Sechem, then laid siege to the city of Thebez in Palestine (not to be confused with the Greek Thebes). Abimelech was struck by a chunk of millstone thrown by a woman of Thebez, and commanded his armour-bearer to finish him off. 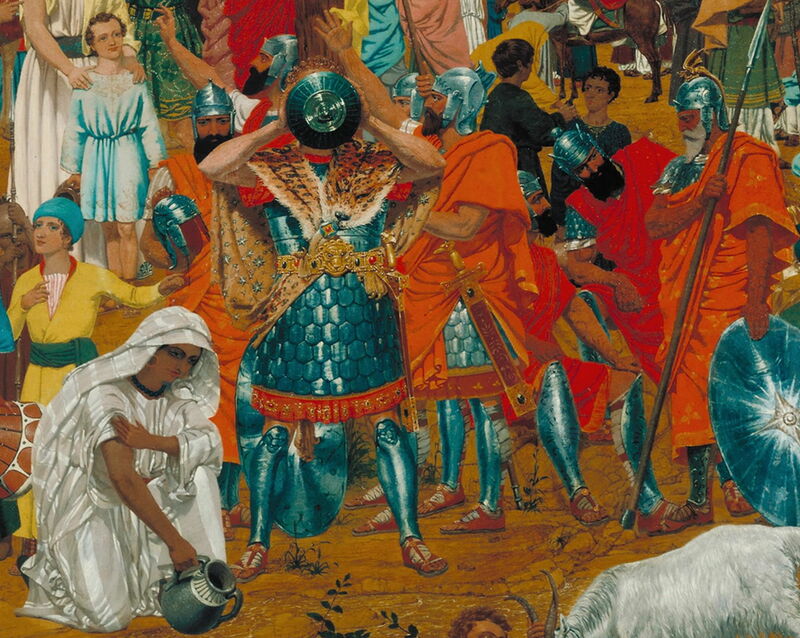 Dadd shows the stricken Abimelech in the lower part of his painting, the armour-bearer’s sword delivering the coup de grâce. The composition has another focal point at the confluence of an axe, spears, and the hands of two warriors, who again are reminiscent of David’s Oath of the Horatii. Richard Dadd (1817–1886), Jason and Medea (1855), watercolour on paper, dimensions not known, The Victoria and Albert Museum, London. Image courtesy of and © Victoria and Albert Museum, London. Dadd did not confine his stories to the Bible. 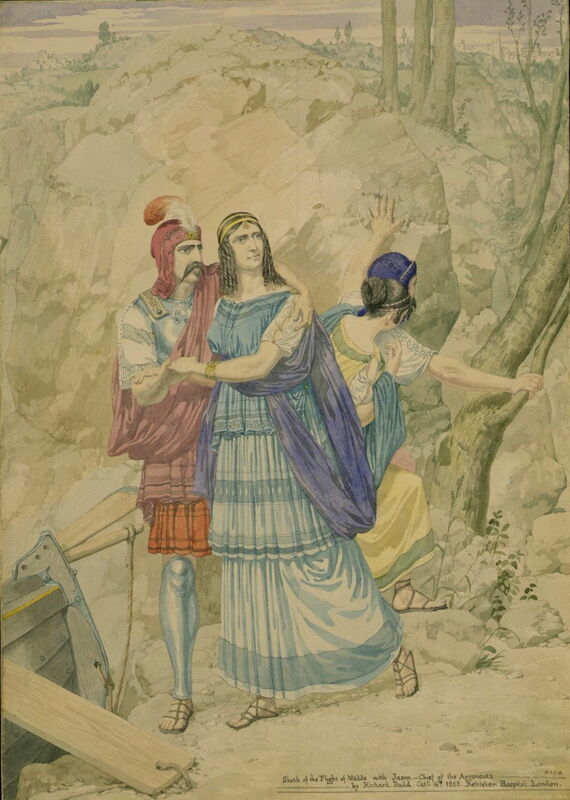 His watercolour of Jason and Medea, or The Flight of Medea with Jason – Chief of the Argonauts, which he dated 16 October 1855, refers of course to the classical myth. This was a popular theme for ancient Greek vase paintings, although it seems unlikely that Dadd would have had access to images of those at the time. This shows an episode after Jason had gained the Golden Fleece. When he and Medea returned to Iolcus, Pelias was still king, so Medea used her sorcery to persuade the king’s daughters to kill him, and boil his dismembered body with ‘magic’ herbs, in the hope that this would turn him into a young man again. Medea then fled with Jason, to live in Corinth, where they settled and had a family. Dadd’s painting shows Iolcus in the distance, and Medea’s maid watching to see if they are being pursued. Medea’s very masculine appearance results from the artist’s inability to obtain female models while he was in Bethlem. Posted in General, Life, Painting and tagged Bethlem, Dadd, David, landscape, orientalism, painting, PRB, Pre-Raphaelite, Shakespeare. Bookmark the permalink.